According to what has been declared by Gartner, within 2020, the 80% of large organizations and the 25% of medium-sized companies located in North America and Europe will use various tools of cloud FCPM – Financial Corporate Performance Management – leaving the traditional on-permise systems. “Cloud FCPM” solutions are used to rule the financial performances of the company and allow Finance to manage the financial closure and apply appropriate controls throughout the accounting cycle. In this new research titled “Magic Quadrant for Cloud Financial Corporate Performance Management Solutions”, Gartner classifies the best Cloud FCPM solutions judging also all the vendors of the market with specific inclusion criteria. Among the evaluation criteria selected by Gartner to include a vendor of FCPM solutions in the “Magic Quadrant” there are: the offer of cloud solutions available either through subscription mode or pay-per-use mode, the ability to support a minimal set of features (like financial consolidation, financial reporting, cost management, financial planning and forecasting, revenue reconciliation, intercompany transactions and disclosure management) and the possibility to market the FCPM solution on its own, independently from the other applications already used by the company. 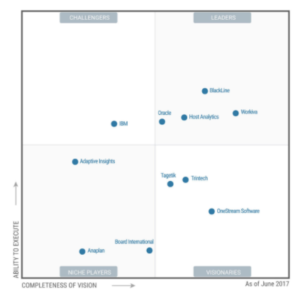 Oracle not only falls within the research having all selection criteria determined by Gartner, but is even identified as market leader. The Californian company has recorded over the years an increasing role in the FCPM world thanks to the overall success of the Hyperion solutions. Oracle’s offer is also available as a service mode and the company has focused on making the two proposals, on premise and on demand, equally efficient. The main strengths identified by Gartner that allowed Oracle to get one of the first places in the ranking are related to the great experience of the company, to its global presence with a high market penetration and to the power output of the ecosystem made by various technology partners. Oracle has managed to constantly improve the capabilities of different cloud solutions that make up its offer in order to effectively respond to the increasingly complex needs of large companies.